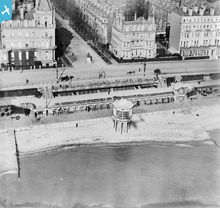 The bandstand on Eastbourne's seafront before the current one was built in 1935 forming a semi-circular shape jutting out onto the shingle beach. The statue of the Duke is still there. The clarity of this image is remarkable. The birdcage bandstand stood from 1884-1934 (ref "Eastbourne's Story" by John Surtees). The tub-like object in the road opposite the statue can be seen on old maps - it was a drinking fountain.